Do You Know the Real Pad Thai? In North America, every Thai restaurant has Pad Thai, and most people think they know what it is. But the truth is that there is so much Westernized Pad Thai out there that I bet few people actually know what real Pad Thai, like ones we have in Thailand, actually tastes like! Well, take it from a Thai person (me), it’s supposed to taste like this recipe. 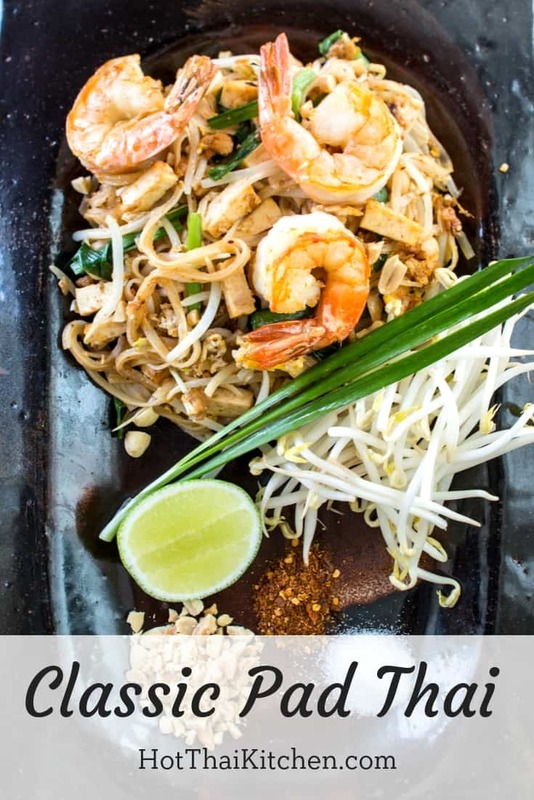 Yes, there are many variations of pad thai out there in Thailand, so of course this isn’t the only way to do it, but if you want to get to know the basic, original, classic flavour, this is the one. Why is it not orange? When I worked as a chef, I had Pad Thai on the menu. A customer called me out one day and asked, “Why is your Pad Thai not orange?” She was clearly disappointed. I explained to her that classic Pad Thai in Thailand is not orange, and that most of the orange Pad Thai in the US has been made that way so that the colour would be more appealing to customers. Some places use ketchup for the colour, others use paprika. Neither of these are Thai ingredients, needless to say. She didn’t look convinced, but there was nothing more I could’ve said. But there is orange, authentic Pad Thai. If you want to try some an orange, but still authentic Pad Thai, check out my Pad Thai Variation recipe here!